Spending some time with David Horowitz’s fascinating volume entitled Left Illusions…interesting how the arguments of today’s “progressives” are so similar to those of the New Left and its antecedents. Members of that movement felt that they were misunderstood by most Americans, who were too dumb to realize that the “progressives” were trying to “help” them. “We’re doing this for you!” a young Horowitz cried in his head as he marched in the 1948 May Day parade while being heckled by curious onlookers who denounced the marchers as subversive Communist agitators. Barack Obama, a child of the New Left, seems similarly frustrated by opposition to his misguided attempts to “help” Americans through the institution of “progressive” policies. One hope’s eventually Obama will come to his senses as Horowitz did. 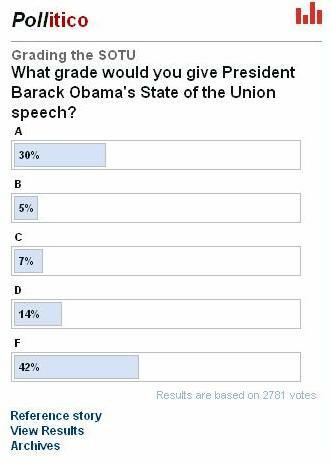 Politico has a poll right now asking respondents to rate Obama’s State of the Union speech. 42% give him an F, 30% give him an A. 2781 Respondents as of 10:45 CST. It was difficult to watch President Obama’s first addressing of the Congress without noticing the unbridled exuberance Nancy Pelosi exhibited throughout as she popped so energetically out of her chair at each applause line. In contrast, Joe Biden barely paid enough attention so as to know when to clap at all. In light of this memory, it seems appropriate to watch the montage again and have the same kind of laugh we have when we watch Howard Dean’s “I have a Scream” speech for the umpteenth time. Because something [like the fact that healthcare reform is in the ER] tells me Nancy may show more restraint this evening. Imagine that, Obama the deficit hawk. In what appears to be a political move intended to appease deficit-weary politicos and the public alike, Obama is poised to announce a halt in non-security discretionary spending. Cutting spending and pushing through an aggressive legislative agenda simultaneously will prove to be quite the balancing act, but I suspect the employment of creative fiscal gymnastics by Team Obama will make matters easier. Obama to propose spending freeze – Glenn Thrush and David Rogers – POLITICO.com. On Wednesday evening, President Obama will deliver his first State of the Union address. It comes at a critical moment. We must regroup, refocus, and re-engage on the vital work ahead. So let’s watch it together at a State of the Union Watch Party in your neighborhood. We’ve hit some serious bumps in the road recently in our march toward change. We always knew it would be difficult, but this past week has definitely been a hard one, for all of us. But this movement didn’t come so far without making it through some challenging times. It’s at moments like these when we need you most. People are hurting. Our country is at a crossroads, and in communities like yours all across America we must all fight for the progress our families and businesses need to thrive. The President’s resolve has never been stronger to keep fighting for health insurance reform, for lasting job creation, and to rein in the big banks and fight the undue influence of lobbyists. Wednesday’s speech will be a pivotal moment for us all to get on the same page and continue the fight together. In just two days, OFA supporters like you will be gathering at State of the Union Watch Parties in living rooms and community centers across the country. You can share ideas and experiences — and I’ll be joining on the phone for a special strategy huddle before the speech. Its on now. Bill is going right after national security. When it comes to Iran, Obama says he will not take the military option off the table. Says he can’t divulge detailed plans for a response to Iran. Diplomatic options and sanctions have not been exhausted. “Maybe” that will work says Bill. Bill says Obama was right–Iraq was a mistake–but that Obama needs to admit the surge worked. Obama responds that the surge succeeded. But he will not admit he was wrong because we’re still wasting money over there. Bill challenges Obama to get the Iraqis to pay us back with oil money. Then Bill call out Obama for saying McCain can’t find Bin Ladin. “You won’t invade Pakistan,” Bill says. Obama wiggles out, says time to put more pressure on Pakistan. And like that, its over. Unlike his two-piece interview with Hillary, this one will be split up over 4 nights!